Although the principles are not new (except for that of minimal disturbance to the soil), it is the fact that they are applied together in conservation agriculture that generates positive outcomes. All the practices (minimal tillage, soil cover and crop rotation) are combined for synergy and added value. In the past, farmers may have tried but abandoned the use of cover crops or zero tillage because of weed problems or yield declines. There is also a need for improved weed control and rotations for biocontrol of pests and diseases and nutrient uptake. Integration of the conservation agriculture principles provides a win-win situation for both people and the environment, which has catalyzed successful expansion of the area under conservation agriculture worldwide. avoid physical or chemical damage to roots and soil organisms that would disrupt their effective functioning. The reduction of soil disturbance through zero-tillage, the use of cover crops and the preservation of crop residues on the soil surface result in increased activity of the soil and in the accumulation of organic matter, mainly in the topsoil (Figure 22). An argument often heard in the discussion on conservation agriculture is that it is only feasible in the humid and subhumid tropics and that the generation of sufficient biomass in semi-arid regions is the limiting factor to start implementing conservation agriculture. However, recent research has shown that even in semi-arid areas of Morocco the application of the principles of conservation agriculture bears its fruits. Mrabet (2000) reports higher yields through better water use and improved soil quality; the latter caused by an increase in soil organic C and N and a slight pH decline in the seedzone (Bessam and Mrabet, 2003; Mrabet et al., 2001a, 2001b). World soils are important reservoirs of active C and play a major role in the global carbon cycle. 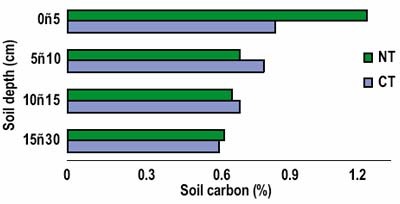 As such, soil can be either a source or sink for atmospheric CO2 depending on land use and the management of soil and vegetation (Lal, 2005) (Figure 23). The conversion of native ecosystems (e.g. forests, grasslands and wetlands) to agricultural uses, and the continuous harvesting of plant materials, has led to significant losses of plant biomass and C (Davidson and Ackerman, 1993), thereby increasing the CO2 level in the atmosphere. In particular, the practice of burning agricultural fields before cultivation has a disastrous effect on soil organic carbon content. 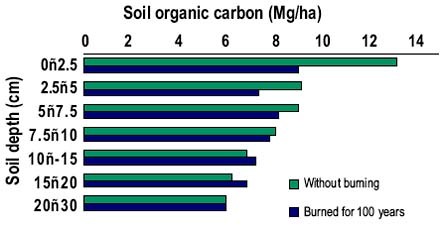 Figure 24 shows the reduction in soil organic carbon in agricultural fields after 100 years of burning crop residues and weeds compared with an area that was not burned or ploughed during the same period. The topsoil layer (0-5 cm) represented the greatest carbon loss (36 percent) compared with the area that was not burned. Soil N stock in the same layer was reduced by 16 percent. The carbon stock was reduced not only through burning, but because of the whole land-use management, especially a drastic reduction in diversity of species as monocropping was practised (Amado et al., 2005). Note:Conventional (CT) and conservation (NT) agriculture, after two complete cropping cycles (4 years). Source: Prior et al., 2003. Table 7 lists general practices that determine whether soil will be a sink or a source of atmospheric CO2. As shown in Table 7, soil can play a part in mitigating CO2 levels (Paustian, 2002). This removal process is achieved naturally, and quite effectively, through photosynthesis. Living plants take CO2 from the air in the presence of sunlight and water, convert it into seeds, leaves, stems and roots. Part of the CO2 is retained or sequestered, or stored as C in the soil when decomposed. In particular, systems based on high crop-residue addition and no tillage tend to accumulate more C in the soil than is lost to the atmosphere. Carbon sequestration in managed soils occurs when there is a net removal of atmospheric CO2 because C inputs (crop residues, litter, etc.) exceed C outputs (harvested materials, soil respiration, C emissions from fuel and the manufacture of fertilizers, etc.) (Izaurralde and Cerri, 2002). Management practices that increase soil C comply with a number of principles of sustainable agriculture: reduced tillage, erosion control, diversified cropping system, balanced fertilization, etc. In the early years of no-tillage systems, the organic matter content of the soil is increased through the decomposition of roots and the contribution of vegetative residues on the surface. This organic material decomposes slowly, and thus the liberation of C to the atmosphere also occurs slowly. In the total balance, net fixation or sequestration of C takes place; the soil is a net sink of C.
Source: adapted from Lal, 2005. Figure 25 illustrates the fact that some cropping systems can act as a sink for CO2. In this example, the carbon stock in soils under natural vegetation is used as a reference (steady state: DC = 0). In eight years, the fallow/maize system liberated 4.3 tonnes of CO2 per hectare. The maize/mucuna system showed a positive balance of almost 20 tonnes of CO2 per hectare compared with fallow/maize. Compared with soils under natural vegetation, this means a capture of atmospheric CO2 of more than 15 tonnes/ha in eight years. 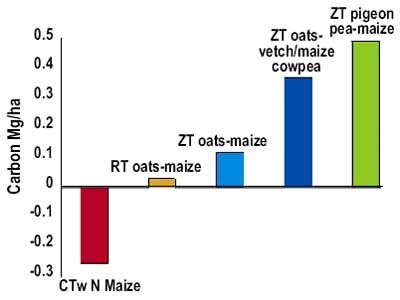 Lovato (2001) found an increase of 2 tonnes/ha/year over 13 years in a rotation system of oats - common vetch/maiz - cowpea. These figures confirm the potential of conservation agriculture for carbon sequestration. However, the simple change from soil tillage to zero tillage is not enough. According to Lovato et al. 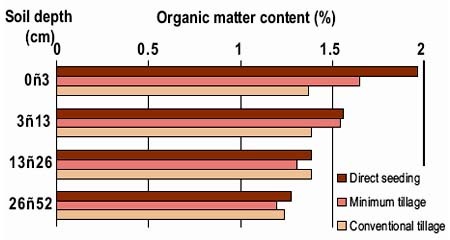 (2004), a minimum addition of 4.2 tonnes/ha/year of carbon in vegetative residues in cropping systems and 4.5 tonnes/ha/year in mixed systems of pastures and crops (Nicoloso, Lovato and Lanzanova, 2005) is necessary for maintaining soil organic matter at stable levels. 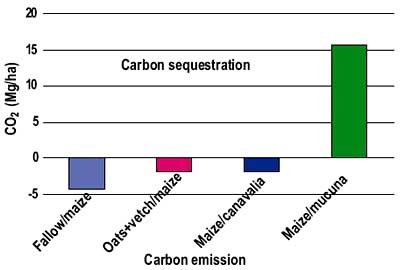 This means that below these values CO2 emission will or can take place and, thus, that for conservation agriculture systems to become successful in promoting carbon sequestration, it is necessary to include crops and pastures in the rotation that add large quantities of biomass. Even more C can be stored by adding leguminous cover crops to the rotation cycle. This is shown in Figure 26, based on two long-term experiments in Rio Grande do Sul, Brazil. Besides addition of C to the soil, legumes add a substantial quantity of N to the soil, which results in increased biomass production of succeeding crops. Source: Amado et al., 2001. Assuming an average carbon accumulation of 0.5 tonne/ha/year, an area like southern Brazil (Rio Grande do Sul, Santa Catarina and Paraná) under conservation agriculture would have the potential to sequester 5 million tonnes of C annually, which corresponds to 18 million tonnes of atmospheric CO2. To compare, Brazil as emitted an estimated 84 million tonnes of CO2 in 2000 (Carbon Dioxide Information Analysis Center, 2003). Recent studies have shown that soil temperature is one of the main climate factors that influence CO2 emission. High soil temperatures accelerate soil respiration and thus increase CO2 emission (Brito et al., 2005). This has implications for the landscape and land use in a certain area. On convex slopes and hilltops, emission is greater than in foothills, where temperatures are normally lower. The foregoing indicates that not only for soil and water conservation is it important to protect the soil with vegetation (reduction in soil temperature), but that it is advisable to cover the soil also with a view to reducing greenhouse gas emissions. CTwN = conventional tillage without N fertilizer. Source: Adapted from Amado et al., 2005.